On behalf of the Leopold’s Ice Cream family, Congratulations and thanks for thinking of us for your big day! 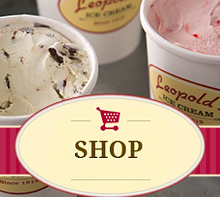 Leopold’s Ice Cream would love to be a part of your special day. Let us help make your wedding season fun and exciting! Our super-premium ice cream, retro carts and professional soda jerks will make your engagement party, rehearsal dinner or wedding reception a memorable one! Is an ideal “Groom’s Cake” or a late night snack for your guests! Is available for parties outside of Savannah, ask for rates! Has carts to fit any size party & can go just about anywhere! Works seamlessly with wedding planners! Is the perfect surprise for your spouse to be! Click here for the basic outline of our ice cream cart catering program. You’ll notice that the Single Scoop Sundae is your best value. All those fabulous homemade toppings AND our super-premium ice cream! Again, Congratulations! We look forward to helping you sprinkle a little fun into your wedding season with Leopold’s Ice Cream!